Last night I was vomiting in the road, today I am, if not kissing babies, then at least holding them up for photos. I am in Lucknow, capital of Uttar Pradesh, a state plagued with horrendous roads and an erratic supply of electricity. But my luck has changed here: Lucknow is a very civilised city and I am able to sleep and I can stop feeling slightly deranged. 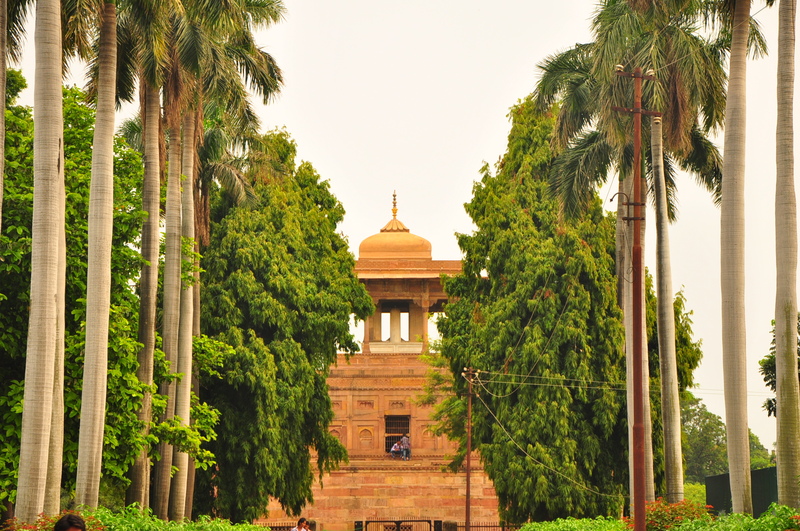 It’s not a popular attraction on the tourist trail, but there is a lot of history in Lucknow. The past two weeks has encompassed time in the village of Bodhgaya, where Buddha found enlightenment and I found an intermittent supply of electricity, the Holy City of Varanasi with tiny alleyways, cows and cremations, followed by Allahabad, messy home town of Nehru. Then I ventured to Chitrakut, a ‘mini’ Varanasi by the Mandakini River with an intermittent supply of electricity which looks very 19th century apart from motorbikes and lights. In Chitrakut I stayed at a potentially fabulous guesthouse with a large balcony overlooking the Ramghat and the pilgrim boats rowing up and down. 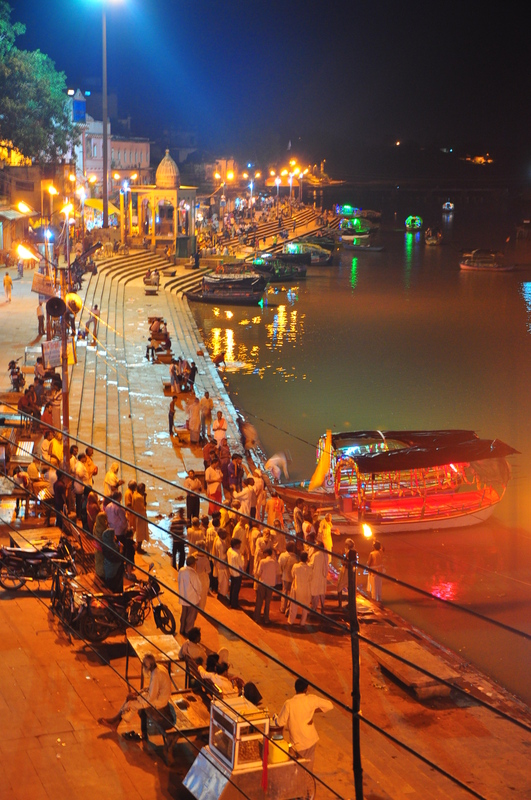 Chitrakut and the surrounding area has many sites of sacred interest to Hindus. 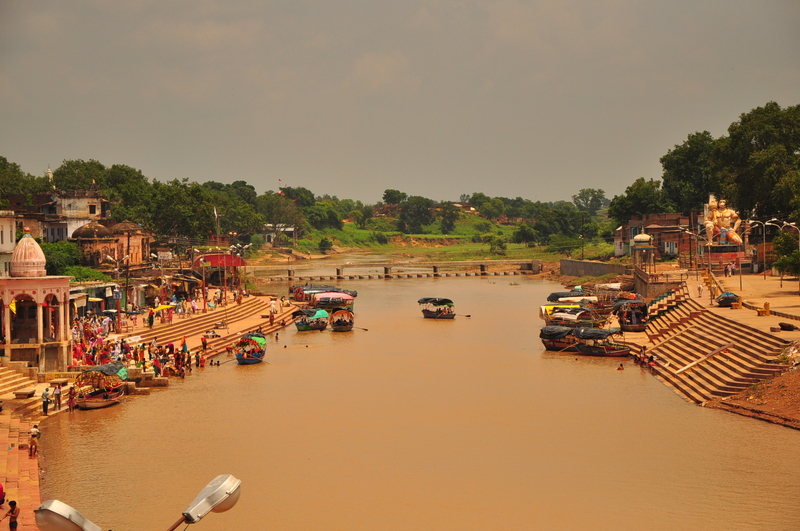 There are aarti (offerings) on the river in the evening, but no internet cafes and not a tissue to be had anywhere. Snack time: Puri Man crushed the tops of the small deep-fried bread spheres, put some corn mixture in it then dipped each one in a vat of what one local described as ‘water’, but is a kind of broth with various herbs in it. Each one tasted slightly different. I arrived there rather fatigued after an early train from Allahabad, but there was about 15 minutes of electricity that evening, and instead of sleeping I lay there in a pool of my own sweat, fuming about not being able to sleep. 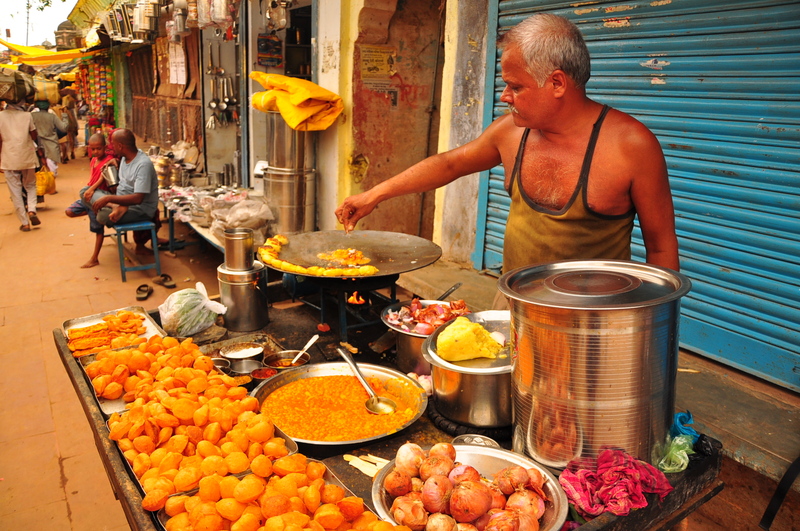 However there was some great street food from the Puri Man. The samosas here were good too. Small, but only three rupees each. Bargain. Allahabad is a rather messy city. It’s difficult to describe the loud mashing of vehicles, animals, mud and people that awaits outside the railway station. The journey there was very pleasant – met a charming family from Hyderabad who were doing the rounds of sacred sites with the aged relatives and had just been to Varanasi. As Hindus they felt spiritually uplifted by the visit. Son-in-charge also had an iPad and showed off one of the latest games. 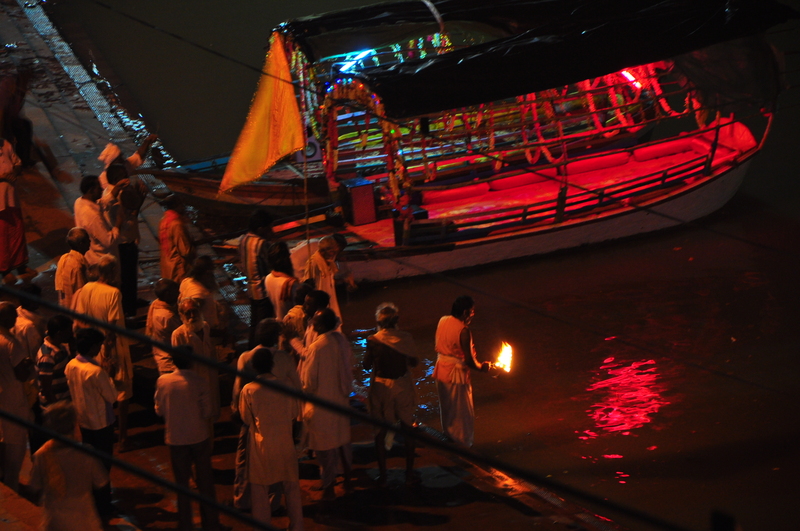 They were staying in Allahabad to visit Sangam, an auspicious point where two of India’s holiest rivers, the Ganges and the Yamuna, meet. Going out there in an autorickshaw the streets are impossibly congested, and the driver tries to drop me at a concrete bridge. 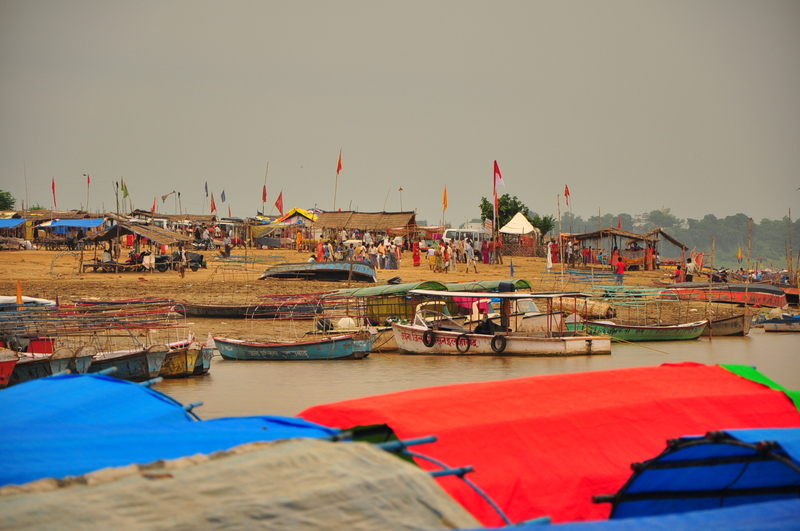 However we continue to Akbar’s Fort, next to a huge muddy riverbank at which millions of pilgrims converge during the dry season, when I imagine it is a huge dusty riverbank. From there they all try to row out to the confluence of the rivers. The boatmen see easy money in a white face and try to tell me the water is different colours where the rivers meet, which I think is fairly unlikely. In any case, I’ve been underwhelmed by confluences before, I don’t like small boats on choppy water and I’m not paying for a boat on my own when everyone else rows out in a group of ten. Instead I go to see the underground temple in the bottom of the fort, which is full of statues and men standing next to the statues wanting money. I am dubious as to where this money goes; at the entrance a contribution for ‘temple maintenance’ is demanded, which I am sure goes straight into someone’s pocket. I whiz through there, march back to my driver who is very disappointed I have not done a boat trip (he must be on commission) and negotiate the obstacle course that is the road back to where I am staying. The Hotel Prayag is interesting. The rooms are quite cheap (about $6) and many Indian travelers stay there. There are no windows to the outside world in my room, just unfortunate vents that conduct a little air and a lot of noise. The bathroom does not encourage me to spend a lot of time in it. I see no women, but there are a number of men in rooms near me who like to lounge about half naked with their doors wide open, admiring their potbellies about six inches from a TV turned up loud enough to be heard from Space. There is no mattress, just a mat that is about an inch thick on a wooden base. Luckily I sleep on my front which is reasonably squishy, but it’s a tad hard for a Western body. The electricity goes off and on constantly – sometimes the lift is not operating and I have to take the stairs via the rather scary kitchen where black is the dominant colour. The generator kicks in noisily when the electricity fails – this is to be expected in the state of Uttar Pradesh. It’s probably just as well I realised that after I arrived. Despite producing half of India’s prime ministers, the state suffers from low literacy, a high birth-rate and poor governance. I am feeling rather despondent in Allahabad, poking along in mud and huge puddles being honked at constantly is not a lot of fun, so I am relieved to discover my lack of enchantment here is perfectly justified. Allahabad does have two nice parks, one with a rather Oxbridge public library and another with Moghul tombs (Prince Khusru’s mother takes an overdoes of opium distraught at bitterness between father and son), though I’m not sure they are a compelling reason to visit. I am served breakfast by the grumpiest waiter ever at the Prayag – he literally throws my omelette on the table, maybe he is anti eggs – but what is great about this hotel is its proximity to the railway. When I leave, I am five minutes’ walk from the station. I am in Chitrakut by midday where I relax before mini religious festival fervour grabs my eardrums and gives them a good shaking. The local population are rather charming, you’d think they’d never seen a tourist before as they crowd around to watch me a put a band aid on my foot. Then I meet some more young men and they take photos and make videos about my momentous visit to their parts. 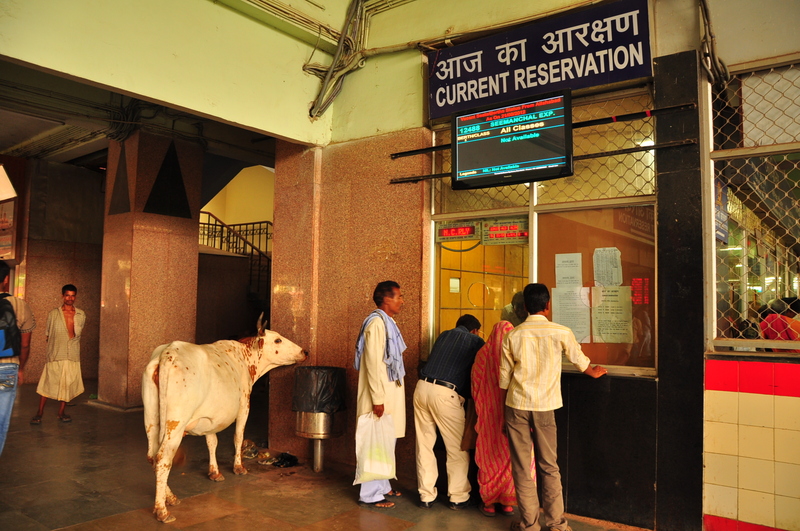 When I leave Chitrakut, I have to catch the 2am train to Lucknow which is an hour late. The small train station is full of people sleeping on the floor and the women’s toilets are bathed in an inch of water. I’m not going in there – thank you Universe for pelvic muscles. And you have to pay for the privilege too (of braving the flood waters, not bladder control). A woman prods me and says: ‘Lucknow.’ So I get off and go to meet a Lucknowite who takes me to a film festival where we watch a film from the Seventies about taxi drivers in Bombay. I’ve encountered a lot of taxi drivers lately, and it helps me understand why most of them are so grumpy. Then I have to rest a little before we go out in the evening and weirdly I have no appetite at all, then expel a lot of water in the street on the way back. This is a first: exhaustion vomiting. Anyway, now I am in a place where there are lovely amenities such as electricity and mattresses, and I finally sleep, to be ready for some monuments and more photos with the local populace. And I am reacquainted with Dr Bhimrao Ambedkar, hero of the Untouchables, but he and his formidable study regime must wait until the next post.